In addition to meeting at the Midwinter and Annual conferences, the ALA Board meets twice a year at ALA Headquarters in Chicago, once in October after the final budget close (ALA’s fiscal year ends on August 31st) and again in April. Senior Associate Executive Director Mary Ghikas put together the following numbers for the Board’s meeting this past October. I know a lot of ALA members don’t normally see this kind of aggregated information, so I thought I’d share it here. This is a 62% increase. In addition, ALA’s Executive Director assembles a summary report for the Board before each of its meetings, so here’s Keith Fiels’ report for October 2013Â (269 KB PDF). Additional information about ALA’s budget can be found on the Treasurer’s page on the ALA website. Three days before this year’s Annual Conference, I fielded a question Lisa Rabey tweeted to the Annual account asking if ALA has a code of conduct for its conferences. I verified with other staff that we didn’t have one, but knowing that this has come up a couple of times in the past, I connected Lisa with the current and incoming chairs of the ALA Conference Committee to discuss implementing one. Then the topic exploded online in multiple discussions on a variety of channels (blogs, Facebook, Twitter, etc. ), all of which I did my best to capture in a Storify. It’s available publicly for anyone who wants the background (please email me at jlevine [at] ala.org or tweet me @shifted if you know of a discussion I missed and I’ll add it). We already knew we needed to formalize something, so discussions began after the Annual Conference, and that process continues. Staff (ALA Conference Services and Senior AED Mary Ghikas) and members (the ALA Conference Committee plus individuals who participated in the discussions online) are continuing to work on crafting a document.Â The intent is to have the Board approve the final language at its October meeting so that we can post it on both the Midwinter and Annual websites. Why are we doing this? Although it’s true there’s concern that not having a code of conduct will hurt our ability to book potential speakers, the most important reason is that we want our attendees and speakers to know that our conferences are a safe place for them.Â Diversity and respect for others are core values of the Association and of our members, values we take very seriously. Now we’ll be noting that publicly and making the information readily available for anyone attending our conferences (note that any code ALA implements will also apply to division conferences). I’ll post an update when there’s more to report, but you can also track announcements directly from the Conference Committee and the ALA Executive Board on ALA Connect. Just log in to the site, go to a group’sÂ home page, and click on the “Follow this group” link underneath the group’s name. This will subscribe you to email notifications whenever the committee posts something new and marks it as “public.” You can even comment on any public content if you’re logged in to Connect in order to give feedback. As I noted, this issue has come up before, but I want to thank Lisa Rabey and Andromeda Yelton for going the extra mile and volunteering to help with actual implementation this time. It’s when members step up and come together around an issue that good things happen. Update: Â The draft “Statement of Appropriate Conduct” was approved by the ALA Board at its October 2013 meeting and it now appears on ALA conference websites (see the Midwinter 2014 site for an example). Thank you again to everyone who helped make this happen! ALAâ€™s Conference Services and ITTS staff have been working together to implement a new Event Management System that would handle everything from taking program proposals for ALA conferences to handling committee reviews of proposals to placing accepted sessions in specific rooms and producing setup reports for each venue. Itâ€™s an ambitious project, in part because it would finally give us one place where someone could go to submit a program idea to any ALA unit or ALA itself. The plan was to implement the new system this summer and be ready to open the form for meeting room requests for the 2014 Midwinter Meeting this month. One month later, the new Annual 2014 meeting room request form would open in October, and then a new public proposal process would begin in spring 2014 for the 2015 Annual Conference. After a lengthy RFP process that began in August 2012, ALA chose a new vendor in March 2013 and we began working with them this past June to implement the first forms. However, by August it became clear that the system wasnâ€™t going to meet ALAâ€™s needs after all. So for ALAâ€™s 2014 conferences, weâ€™ll be reverting back to using the previous system that was in place. What couldnâ€™t the new system do? Unfortunately, quite a few things because ALA does conferences differently than almost every other organization out there. An internal discussion has started about the need to simplify ALAâ€™s processes, especially in light of our budget issues. One of those discussions will center on how we do conference planning. It costs too much money and takes too many resources to maintain our status quo. The way things work now, every unit designates a meeting planner who submits that unitâ€™s sessions. Sometimes itâ€™s a staff person (in the case of divisions), sometimes itâ€™s a member (often for a round table). That partâ€™s fine because only that unit knows what committee meetings and programs itâ€™s going to offer. What has to change is how units can submit requests that deviate from a standard setup. Itâ€™s those exceptions that have to be pre-programmed into the system that take so much staff time (not to mention money) to accommodate. Thereâ€™s no Event Management System out there that handles AV and room setup requests from 60+ meeting planners out of the box. It requires a lot of customization just to handle room requests from 60+ units, let alone produce the AV and catering reports for 2000+ sessions. Other organizations donâ€™tÂ allow this many people to decide room and AV setup at the meeting-by-meeting level, a fact that became painfully clear when we began to explore alternative systems last year. Before we can [again] begin investigating our alternatives for future conferences, we need to talk about how to simplify and streamline our processes so that units can still submit their meeting information, while ALA Conference Services handles planning the room setup and AV for each session. Changing this part of the process is a first step towards expanding the software options available to us and reducing the complexity that hangs around our neck like an albatross. Reducing the footprint of the conference is working, and we need to figure out what else we can simplify in the planning process. Thatâ€™s what weâ€™re going to do this fall, and weâ€™ll be posting updates and soliciting feedback here. Watch this blog to learn how you can make your voice heard and share your ideas. Good ideas are what will make things better and help us build a better process, and we need yours. If you’ve been an active voter in ALA elections, you know that the ALA Governance Office made some changes last year to start making the whole process easier. For example, JoAnne Kempf in the ALA Governance Office put together a handy brochure about the candidates and various offices to help make sense of the crazy long ballot. For the first time, voters could also use mobile devices to fill out their ballots. This year, even more changes for the better are coming. I recently learned that we’re finally going to get change my own personal pet peeve as a voting member, the separate login. That’s right – for the 2013 election you’ll finally be able to log in with your regular ala.org username and password. Please take a moment to do a little chair dance with me. Another feature I’ve always wanted is an “I voted” badge I could share and put on my personal site, and I’m happy to say this is also being implemented for 2013. Once you submit your ballot, you’ll be shown the badge and share options. As an ALA staff member, I can’t share how I voted, express support for a particular candidate, or help with a candidate’s campaign, but I definitely want the ability to easily show that I did vote as a member. In addition, ALA staff got together to standardize how candidate information will appear on the ballot across all units, and JoAnne will do an updated brochure about the candidates. JoAnne and Lois Ann Gregory-Wood are continuing to improve the process where they can, but we’re always open to your suggestions. The 2013 election will run from March 19th through April 26th, with announcements made on May 3rd. You can find past election statistics on the ALA website, but the percentage of voters has generally been trending downward since a high of 39% in 1970. I’m hoping these kinds of changes will reverse that trend, because we all need to take an active interest in the future of our association. When the time comes, I hope you’ll help us get out the vote! Addendum, March 18, 2013: Unfortunately, it turns out we’re not going to be able to offer voting using existing member logins this year. Instead, eligible members will get the same type of email they’ve gotten in the past with a unique login they use just for voting. Hopefully we can implement single sign-on for the 2014 election. I got a first-hand glance at some of the inner workings of ALA policy and procedure during the past six months as I helped shepherd GameRT to round table-hood, so I thought I’d share that experience here to help illustrate one way in which groups form within the Association. Back in 2007, ALA member Scott Nicholson noticed that the new wave of more social board games and video games were allowing libraries to expand the gaming programming so many of them had already been offering for decades, if not longer (think chess, SCRABBLE, summer reading programs, etc.). To help librarians share knowledge to grow their programs, he formed the original ALA Games and Gaming Member Interest Group (GGMIG), a community that crossed all types of libraries and all types of games. To start an ALA-wide member interest group (a MIG) only takes signatures from 100 current ALA members and a mission statement/charge. The request then goes to “COO,” ALA’s Committee on Organization. While it’s true that anyone can create an informal community using ALA Connect, but if you want a more official informal group, you start with a MIG. I used to be one of those people who jokes that only ALA would need a “Committee on Organization,” but we are, after all, librarians, and we do need a group to manage the organization of new, official groups. After sitting in on a couple of COO meetings, I now realize the group is very necessary if we want to avoid duplication of effort and resources (an important function in an association that will turn 135 next week). Finding no existing groups with conflicting charges or goals, COO recommended to ALA Council that the GGMIG be approved. Council did exactly that in 2008, and the MIG popped into existence. Dr. Nicholson was the MIG’s first chair, and it was able to start presenting programming at ALA conferences. You can find their session at both Midwinter and Annual on Saturday mornings, from 10:30 a.m. to noon. As the group’s activities expanded, though (helping with National Gaming Day @ your library, running the popular Open Gaming Night social at Annual, etc. ), it became clear the MIG needed to become a Round Table in order to better meet its goals. So in 2011, then GGMIG chair Chris Harris and incoming GGMIG chair JP Porcaro submitted the required 100 member signatures requesting that the MIG become the Games and Gaming Round Table (informally known as GameRT). They also had to come up with a starter mission statement, bylaws, and how much the dues would be. The request went through the same cycle as the MIG, so it started at COO and was recommended to Council, which approved it at the 2011 Annual Conference. Round Tables are the next step up in the ladder of official ALA groups. Whereas members don’t have to pay dues to join a MIG, round tables are something you formally pay a small amount of money to join. This gives the round table a budget it can use to implement its activities. Other differences between the MIG and GameRT are that the round table can make formal recommendations to ALA, issue publications, give awards, and partner with other organizations. 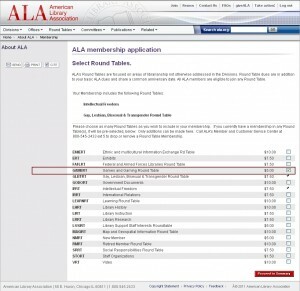 In addition, if GameRT’s membership reaches 1% of ALA’s total membership, it gets representation on ALA Council. 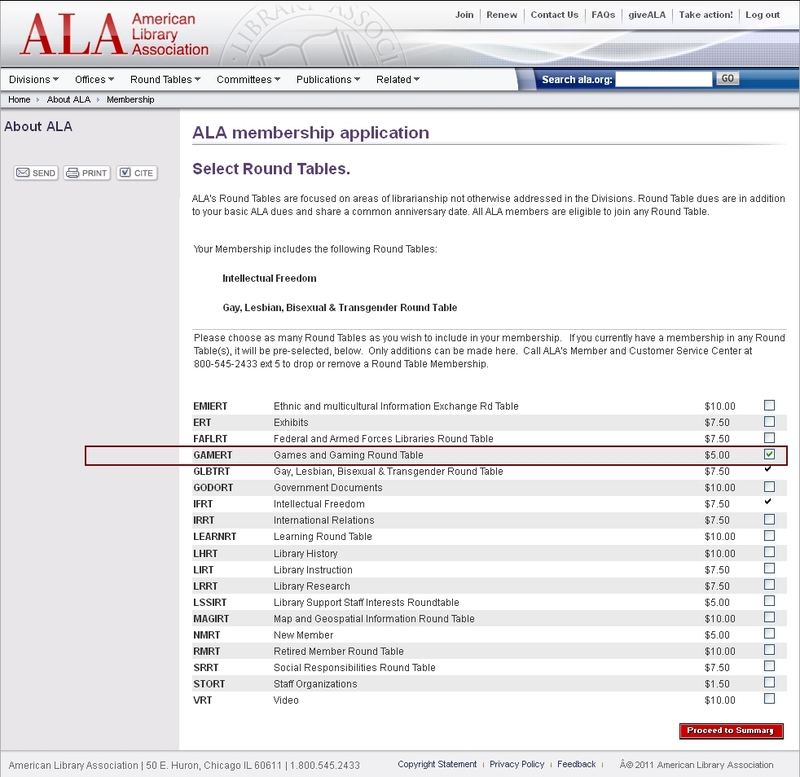 Because ALA’s fiscal year runs September 1 through August 31, new groups get added to the membership form and into our member database in September. That work was completed this week, which means GameRT is truly official now and ALA members can now log in to ala.org and join the Round Table for $10 (my cost was pro-rated because I’m halfway through my current membership year). There’s also a new GameRT group in ALA Connect where members can share ideas, ask questions, etc., and the Steering Committee will begin setting up a committee structure for the Round Table’s various projects (National Gaming Day, ALAPlay at Annual, an award the group will sponsor, updating the Library Gaming Toolkit, and more). In addition, the Steering Committee needs to put together a slate of candidates to run for office within GameRT in the spring 2012 election. The group will need a president, vice-president (incoming president), and a treasurer to handle the money now that they have a budget. Want to volunteer for office or a committee? Contact current chair JP Porcaro. I was always the GGMIG’s staff liaison, so I’m now the GameRT liaison since the MIG no longer exists. I submit the group’s meeting requests, keep the committee rosters up-to-date in our member database, and generally help however I can. I’m their tie into the behind-the-scenes side of ALA, so I help its various groups navigate the ALA cloud to accomplish their goals. I’m really looking forward to working with GameRT members to expand ALA’s gaming initiatives. I hope you’ll join us if gaming is one of your interests. From time to time I’ll post here how the Round Table is progressing, just to share how this stuff happens. I think GameRT is a great example of a dedicated group of members coming together within ALA to advance a part of libraries and librarianship they feel has a lot of value. Consider this the official announcement that you can go join GameRT! What’s with the Long Conference Planning Timeline? Jenny Levine: Conference planning is a BHD (Big Hairy Deal) at ALA, with an emphasis on Big. Last year, I literally diagrammed out the whole process to try to get a handle on it in order to create a new conference scheduler in ALA Connect. Every time I think I understand the full scope of it, I find another piece I didn’t know about or fully comprehend. I’m not convinced any one person within ALA truly knows every detail of every step of every process, although a few folks know a lot more than me. And yet I’m still going to try to explain this behemoth, so here goes. There are exceptions to every rule, but here’s my take on how it works in general, most of the time. Right now it’s May 2011, and we’re about a month away from the 2011 Annual Conference. If you want to submit a program for Annual 2012, you may have already missed the deadline. Yes, you read that correctly – the deadline may have passed. How can that be? If you read my previous post that takes a snapshot look at Annual, you know there are more than 1,600 sessions this year. Granted, most of those are committee meetings that already have traditional time slots they use year after year, but that still leaves almost 350 presentations/sessions and almost 200 discussion group get-togethers. How do you schedule more than 500 new sessions over a three-day period in a way that makes any sense at all? You plan carefully, and each session goes through an approval and placement process. By an overwhelming margin, most sessions are scheduled by the 11 divisions and 18 round tables. The others come from ALA committees, ALA affiliates (like CALA or REFORMA), and ALA exhibitors. In order to mesh their own sessions together so that the unit’s Big Name Speaker or Big Session doesn’t conflict with the unit’s board meeting, membership meeting, etc., many divisions cut off their program submission process just over a year in advance of a conference. The unit’s “program planning committee” also tries to make sure sessions on similar topics aren’t in the same time slot. They usually do this work at Annual,Â where they spend their meeting planning for the next Annual. Mary Ghikas: But, you say, isnâ€™t that too far in advance? In some cases, yes. Some divisions, like LITA, tend to work on a tighter schedule. Some, like ALCTS, may set up â€œplaceholdersâ€ for a day/time but decide on content much closer to the actual event. Most â€œpresidentâ€™s programsâ€ â€“ both for the ALA and for the divisions â€“ are initially entered as â€œplaceholders,â€ with final content determined much later. So this isnâ€™t really as rigid as it may seem at first. Jenny: Diving back into the planning process, the unit program planning committee comes out of Annual 2011 with a plan for 2012, and a representative takes that plan to the Conference Program Coordinating Team (CPCT) meeting in the Fall (a meeting that will become virtual starting this year). This is where representatives of the ALA Conference Committee, the divisions and the round tables try to mesh all of their sessions together to come up with the basic program. They negotiate time slots, look for patterns in like sessions, etc. And even though it seems like every session you want to go to is at the same time on the same day, the CPCT does try to keep similar sessions from being scheduled against each other. Remember, though, that there are really only three days and 4-5 time slots per day in which to pack in those 500+ sessions, in addition to the committee meetings, big name speakers (a.k.a., the Auditorium Series), and other happenings. After the CPCT has finished its work in the Fall for Annual 2012, around 75% of the program is now set. The ALA units now enter all of their sessions into a form for ALA’s Conference Services staff so that they can start all of the preliminary work. Don’t forget that these staff members are also negotiating with the big name speakers, implementing the details of the contracts with the venues, helping prepare catering orders, finalizing the opening of registration, and more. It’s amazing how much behind-the-scenes action there is to pull together a conference the size of ALA Annual. Then in March 2012, the program submission form closes so that ALA staff can begin placing those 1600+ sessions. Because as you might imagine, that takes a little while since we have to take into account the unit’s request for A/V, internet access, location, room size, and other options for every single meeting request. Once all of the sessions are placed, a draft schedule goes out to ALA units for proofreading, and after any requested changes are made, the preliminary program is formalized. In May 2012, the online Scheduler becomes available, and now all of the groundwork has been laid for Annual 2012. Don’t forget that by June 2012, the process for Annual 2013 is already in full swing. Recognizing that this laborious process presents some issues to having timely content at Annual, and also that many members and other potential speakers or presenters do not have an existing â€œrouteâ€ through a division, round table or committee, Jim Rettig instituted the “Grassroots Program” during his presidential year in 2008-2009. This program let anyone submit a session proposal outside of the above-outlined steps without having to go through a division or committee approval process. Â Until that point, it had never been possible to submit a program proposal directly to ALA itself. The response to this was so positive that we kept the grassroots program and it runs every year. For Annual 2011, the grassroots submission form didn’t close until February 2011. Mary: In addition to the formal program proposal process, there are other, perhaps less well-known ways for members to propose more current content for the upcoming conference. Most of the division discussion groups submit placeholder programs and then call for presenters in the spring. Weâ€™re still adding speaker names and descriptions to discussion group meetings at Annual 2011 when we receive them. Look for the discussion groups in your division that match your interests to see if you can get on a panel or submit an idea to them. The deadline for submitting a poster is much later in the process, usually at the beginning of January. See http://www.lib.jmu.edu/org/ala/ for more information about poster sessions. ALA provides the â€œNetworking Uncommonsâ€ at both Midwinter and Annual. This open space can be used for impromptu programs and discussions that donâ€™t have to go through any submission or approval process at all. Any attendee can reserve a projector by adding their name to the schedule, even during the conference itself. Members can submit a program for the Annual Virtual Conference as late as February for the upcoming event. Jenny: So there are more ways than most folks realize to get on a conference program, although we probably donâ€™t market them all as well as we could. The question is, are there other things we can do to mitigate the need for a long planning process? Are there other ways we can help you submit more timely programs later in the process? Is there a different way to do some of this? What do you think? Do you have other questions about the conference planning process? There are many members who try to help with the ALA Civics concept on their own, so I’m also going to try to highlight their work, too. Recently, two great examples of this type of initiative were posted online. Steven R. Harris created an infographic to help explain the major pieces of ALA and how they relate to each other. It’s a great perspective, and I like that he was able to do this visually. Like Steven, I’d love to see others build on it or create their own explanations. Oleg Kagan ran a survey of non-voting ALA members to help determine why they didn’t vote and how ALA could improve the process. The results are pretty straightforward, and I definitely see room for improvement there. I’m pretty sure a couple of different groups within ALA will discuss the results, so I hope to report back about this topic in the future. Have you created something that helps explain ALA or seen something useful that someone else posted? Let me know so I can help highlight it. Why Do I Have to Join ALA to Be a Member of a Division? I missed it in real-time, but the May 11th #libchat on Twitter included a question that asked the following: “Very few ALA members vote in ALA elections. What are some reasons for low turnout?” There were a variety of answers, many of which voiced specific complaints about the organization overall, not just the election process. Personally I’ve heard all of those complaints before, and I was planning to provide some context for each one as we went through ALA Civics Class. However, I’m bogged down in a couple of major projects right now, so rather than wait until we get further into the syllabus, I’m going to try to do a few blog posts during the next week to help explain why some things are the way they are. These posts are informational – I’m not trying to change anyone’s mind or start an argument. To provide context, I want to start by noting that the divisions are relatively small in terms of staff, budget, and resources, even though when you look at their output, it’s a pretty impressive amount of “stuff” (programs, courses, publications, initiatives, coordination, etc.). There are 11 divisions (look in the left-hand column for links) and for the most part, each one has only a handful of staff. From the inside, I can say that most staff are pretty dedicated and do more than could reasonably be expected of them. As a membership organization, ALA and the divisions also rely a lot on member volunteers. When you look at the staff list for a division, you don’t see people dedicated to things like Accounting & Finance, Building & Maintenance, HR, ITTS, and other support services. The reason division dues are less expensive than ALA dues is because all of those support departments and staff are folded into the larger organization. To help pay for those costs, divisions (and other ALA units) pay a standard “overhead” cost that gets built into their budgets. If a division had to pay for a physical building, utilities, an HR department, an IT department, etc., its dues would cost a lot more and would be comparable with the cost of joining ALA. So to be clear, the divisions have to make enough money on their own to support their own services, but they also have to meet enough budget to pay that overhead fee. With that background, it’s easy to see that it would cost well more than $100 to join a single division if it had to pay all of the costs on its own that ALA is covering for it. To join a second division would then cost double that amount, which would quickly put multiple memberships out of reach for most people. If you don’t want to pay more than $65 to join a division, then you probably wouldn’t be happy with the dues you’d have to pay in a setup where that division was off on its own. The second motive I’ve heard for asking this question is that someone doesn’t like ALA’s stance on a particular issue(s), so they’ve dropped their membership. I know it’s difficult to support an organization you disagree with, especially if you’re a single-issue type of voter. However, the thing about ALA is that it does so much and covers so much territory that I can pretty much guarantee you’re not going to agree with all 60,000+ members on every topic. In fact, I don’t know that I even want to be part of an organization where that many people do agree about everything. I don’t say that lightly, because there are things I can’t do as a staff member and other things I disagree with as a member that I WANT TO CHANGE RIGHT NOW. Believe me, I know how frustrating it can be. You know that saying that a good library has something to offend everybody? That’s how I feel about ALA. There’s such a broad range of members that someone is going to be offended about every single thing but that’s okay, and we have to make room for those folks to voice their disagreement. But to me participating is the same as the political process in my country. I’m not ashamed to say I support government and that I think pooling our resources as a society is a good thing. I disagree with some of the things my government does, but I don’t check out and give up because of it. Instead, I try to direct my money and efforts to the pieces I believe in and work to change the other parts. That’s the philosophical approach I take to ALA, too. I wish we did certain things differently. I wish we could move faster on other things. I wish we were better at collaborating internally. But if I throw up my hands and walk away, who’s going to be working for the issues I value and the changes I’d like to see happen? I’m honestly not being a Pollyanna, and I’m not faulting those who have tried and left. I get it, I do. And I’m sorry you don’t like how ALA handled Issue X but I’m willing to bet you support our efforts on Issue Y. That’s how this works. I’m guessing it’s how your organization works. Which is another reason for us all to be one association – because we’re more powerful together and our voice is louder and stronger. Addendum: After I wrote this post, I talked to Mary Ghikas, Senior Associate Executive Director at ALA, because she has a lot of the institutional knowledge that I don’t. In this video, she explains how ALA used to be structured back in the day and describes today’s setup. Annual is big. Really big. I knew this when I took on the task of improving the “Event Planner” folks use to plan their conference schedules, but until I had to work on standardizing all of the data, I didn’t really understand HOW BIG. Logically, you kind of get the numbers. Legend has it that at their height, Midwinter had approximately 2,000 distinct sessions, while Annual had around 2,200 (I’ve also heard 2,500 but can’t fathom that so I’m sticking with 2,200). It’s no wonder it’s impossible to make sense of the program and participants feel like it’s raining sessions. I have some better numbers to report this around, though. The first version of the Conference Scheduler that was integrated into ALA Connect was for Midwinter 2011, and there were just over 1,100 sessions. That’s still a lot, but it’s a far cry from 2,000. Most of those were committee meetings because Midwinter is generally considered the “business meeting,” although that’s changing and we’re seeing a lot more discussion group activity there. Having just launched the second iteration of the Conference Scheduler in Connect for Annual 2011, I can tell you that we’re down to just over 1,600 sessions. Some of that decrease comes from committees holding virtual meetings outside of conference, and some is from sections and round tables holding “all committee” meetings where several groups meet in a big room at once instead of each requesting a separate room and time. Keep in mind that there’s some overlap between these categories, so the numbers are kind of fluid, And while there are just over 1,600 sessions in the Scheduler right now, that number will grow as we add all of the author signings and more informal social events (have one of those to announce? send it to me!). That also doesn’t take into account all of your meetings with vendors and friends, and every presentation you want to go to will still be scheduled at the same time on the same day. But I”m intrigued to see where these numbers go. I also wonder how to quantify hallway discussions, which are usually the best part of a conference. In case you haven’t walked an ALA conference lately, we have a lot of hallways. In fact, I think a vendor should give away pedometers so we can have a contest for most steps walked on the Annual campus. I’m not sure who would win – some staff members, Executive Board members, or those of us who constantly get lost. Having manhandled every one of those 1,600+ session records, I can definitively say that there is something for everyone at Annual. Next I want to think about how we get a better snapshot of Annual After Annual, especially to figure out how we can help facilitate all of the stuff that happens but doesn’t show up in the official categories (ie, committee meeting, presentations, etc.). All of which is a roundabout way of announcing that the 2011 Annual Conference Scheduler is officially open. Let us know what you think about it! ReadWriteConnect: Find ALA blogs, wikis, etc.